Get your pet photo ready by grooming them to purr-fection. By following these 5 easy head to tail grooming tips; your pet's pretty face could become the pin-up of CanadaVet'.com's 5th Annual Pet Photo Contest! 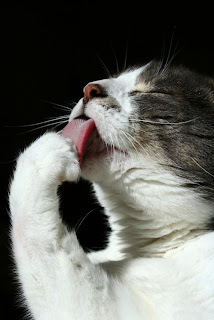 Cats often lick their fur to keep themselves clean, but sometimes pets need to be groomed to get squeaky clean. It may seem obvious, but as your pet looks at you with adorable puppy dog eyes, remember to give them a clean! Dirt often collects around the eyes of pets, similarly to humans after sleeping. When getting down to their eye level for an intimate pic of your pooch, the area around their eyes is a giveaway for a well-maintained, groomed appearance. This can be achieved by using tear stain remover or tear stain wipes daily to gently wipe away any debris or mucus around the eyes. Baths should be part of your pet’s grooming regime. Be careful not to bathe them too frequently though, or you will strip their skin of natural oils which helps keep their coat in top condition. Use shampoos designed for pets, not humans, to prevent skin irritations. Ensure they don’t get soap in their eyes, and rinse them thoroughly. When drying, use a towel and move in the direction of the hair to prevent tangling their coat. Some pets may even appreciate you blow-drying their hair for an extra fluffy coat-style! Think of your pet’s hair as a fashion statement – a well-groomed coat says it all. A variety of brush types are available to suit your pet's fur. Brush your pet’s coat regularly to prevent matting, tangles and knots in their hair; especially if they spend a lot of time outdoors. Long haired breeds will require more frequent brushing than short haired breeds. Brushing also gets rid of dead or shedding hair, and keeps your pet looking healthy, by ensuring natural oils are evenly distributed making their coat shine. As pet owners we would prefer not to have any visible blemishes when having our photo taken. So take the same perspective when grooming your pet for the CanadaVet.com Pet Photo Contest. Good health shows on the outside, so ensure your pet is free from nasty parasites such as fleas and ticks. The bite of a tick may cause imperfections such as a red bump in your pet’s skin, and this can be unsightly, as ticks often latch on to your pet’s ears. In the event of a flea infestation, your pet could also suffer from flea allergy dermatitis (FAD). FAD is an allergic reaction to a flea bite which results in red, itchy, inflamed skin and when scratched, pustules and crusts may develop. Such skin irritations will leave something to be desired in your pet’s appearance. Daily grooming gives you the opportunity to conduct routine health checks on your pet. By running your hands over their skin or parting their coat you can monitor skin irritations so your pet remains free from pests and looks picture purr-fect. Long claws will draw the viewer’s eye, especially in photos; diverting attention away from your precious pet’s face. If nails are allowed to grow too long, they can curl over, causing your pet discomfort as they walk. Keeping your pet’s nails clipped also prevents any accidental scratches when they enthusiastically greet you. Ensure pets, particularly cats, are relaxed before you start. If your pet hasn’t experienced regular grooming from a young age, practice handling their paws a few times first, so they become comfortable before you try clipping. Use pet nail clippers, as opposed to your own clippers. Be careful not to clip too far as the reddened crescent moon shape of the nail is the quick, which contains blood vessels, and may bleed if cut. As an owner, getting your pet’s teeth professionally cleaned can be an anxious time, particularly if they are old, as the scaling procedure often requires putting them under anaesthetic. However, nobody likes bad breath, and ensuring your dog has healthy teeth and gums means you won’t ever have to endure a smelly dog mouth. So before you get up close and personal with your dog to take the ultimate photo, or cuddle; try these easy and affordable dental care options at home to make the experience odourless. Try edible beef flavoured Dentipet Toothpaste for cats and dogs; to clean teeth, kill oral bacteria, reduce plaque and freshen your pet's breath. Alternatively, for horses, dogs and cats; use a Dental Spray Gel with antibacterial properties to inhibit plaque growth. Regular use will prevent gingivitis as well as peridontal disease and will maintain your pet's oral hygiene to keep their breath fresh.